Bad handwriting or sensory issues? By second grade, handwriting can mean the difference between success in school and serious problems. 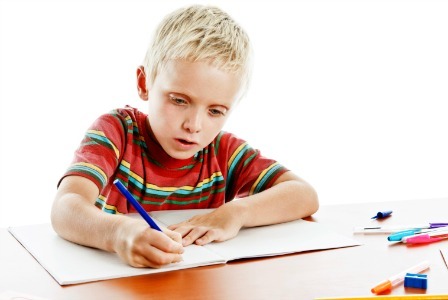 Discover some common issues kids have with handwriting, including problems with fine motor skills and sensory integration. You may be surprised by the number of solutions available to help your child. When kids reach second grade, writing is a big component of every subject. If your child is struggling with handwriting, almost every aspect of school can become a challenge. Curb your child’s frustration by looking into the root of the problem and what you can do to help. Amy Baez is an occupational therapist and the author of two award-winning handwriting workbooks published by Playapy, a website offering resources and toys that support sensory integration and therapy for kids. Baez explains that sensory processing and motor skills can be the issue when kids have problems with handwriting. “If a child is experiencing tactile defensiveness, the child typically avoids touching objects or different textures. This reduces opportunities to develop the proper hand strength and arches needed to adequately grasp a pencil or crayon for writing,” Baez says. Kids with proprioceptive, auditory and visual processing concerns can also experience difficulties, ranging from poor spacing to problems taking dictation. Once you’ve identified potential problems with your child’s handwriting or your child’s school has reached out to you, it’s time to get help. “Parents should raise their concerns with their primary care physician to get a prescription to see a licensed occupational therapist in their area for an evaluation,” says Baez. Once the specific issues are identified, there’s a lot your child’s OT will direct you to do at home, from practice time to using special tools that help kids with handwriting. What really happens during recess?